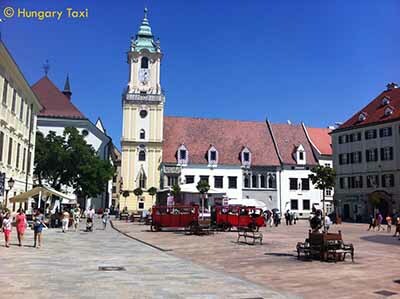 Private car transfer from Vienna to Budapest with stop for scenic tour in Bratislava. Sightseeing in Europ's most glamorous city. UNBELIEVABLE? - Three Europen capital cities in one day, in 6 hours! Our special offer for travellers between Vienna and Budapest is an amazing trip, transfer and scenic tour to Bratislava during the journey. The direct, door to door transfer from Vienna to Budapest does take 2,5 hours, but if you are not in a hurry, we can make a short stop for 2 - 3 hours on the way in Bratislava, for Visiting the Castle Bratislava and to make a short walk in the old-town. 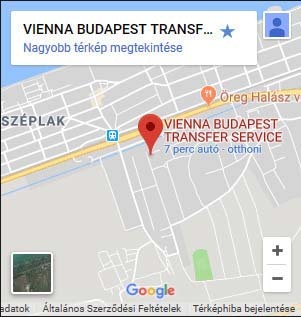 You can book the private transportation, car transfer (Taxi cab, private car, MPV, Minivan, minibus) with an English speaking private driver in both direction from Budapest to Vienna as well. 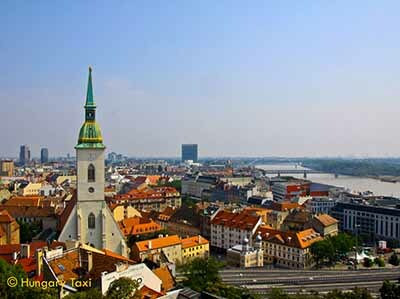 - Culture:Bratislava is the cultural heart of Slovakia. Owing to its historical multi-cultural character, local culture is influenced by various ethnic and religious groups, including Germans, Slovaks, Hungarians, and Jews. Bratislava enjoys numerous theatres, museums, galleries, concert halls, cinemas, film clubs, and foreign cultural institutions. - Old Town Hall: is a complex of buildings from the 14th century in the Old Town. It is the oldest city hall in the country and it is one of the oldest stone buildings still standing in Bratislava, with the tower being built approximately in 1370. The town hall was created in the 15th century by connecting three townhouses, and then went through several reconstructions in the course of the centuries. It houses the oldest museum in Bratislava, the Bratislava City Museum, founded in 1868, featuring an exhibit of the city history and an exhibit of torture devices. The outlook from the top of the Old Town Hall tower offers a round view of Bratislava Old Town and its environs. - Main Square: Hlavné námestie is one of the best known squares in Bratislava. It is located in the Old Town and it is often considered to be the center of the city. Some of the main landmarks found in the square are the Old Town Hall and Roland Fountain. - St. Martin's Cathedral, Bratislava: the cathedral of the Roman Catholic Archdiocese of Bratislava. 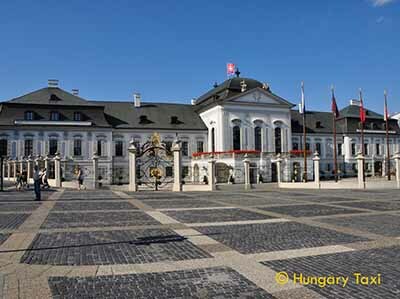 It is situated at the western border of the historical city center below Bratislava Castle. It is the largest and finest, as well as one of the oldest churches in Bratislava, known especially for being the coronation church of the Kingdom of Hungary between 1563 and 1830. The cathedral became the coronation church of the sovereigns of the Kingdom of Hungary in 1563, succeeding the Virgin Mary Church in Székesfehérvár, after the Ottoman Empire conquered that city. In total, the coronations of 11 kings and queens plus 8 of their consorts occurred here between 1563 and 1830, including that of Maria Theresa of Austria. Together with the castle on the hill adjacent, and somewhat similar in its striking but fairly stark Gothic lines and colouring, St Martin's 85 m (279 ft) spire dominates Old Town’s skyline. The tower virtually formed a part of the town’s fortifications, built as it was into the city’s defensive walls. - Bratislava Castle: One of the most prominent structures in the city is Bratislava Castle, situated on a plateau 85 metres (279 ft) above the Danube. The castle hill site has been inhabited since the transitional period between the Stone and Bronze ages and has been the acropolis of a Celtic town, part of the Roman Limes Romanus, a huge Slavic fortified settlement, and a political, military and religious centre for Great Moravia. A stone castle was not constructed until the 10th century, when the area was part of the Kingdom of Hungary. The castle was converted into a Gothic anti-Hussite fortress under Sigismund of Luxemburg in 1430, became a Renaissance castle in 1562, and was rebuilt in 1649 in the baroque style. Under Queen Maria Theresa, the castle became a prestigious royal seat. In 1811, the castle was inadvertently destroyed by fire and lay in ruins until the 1950s, when it was rebuilt mostly in its former Theresian style. - Bridge of the Slovak National Uprising: Most Slovenského národného povstania is a road bridge over the Danube. It is the 32nd-tallest, and thus shortest, member of the World Federation of Great Towers, and is the only bridge to be a member. It is the world's longest cable-stayed bridge to have one pylon and one cable-stayed plane. It is an asymmetrical cable-stayed bridge with a main span length of 303 m (994 ft). Its steel construction is suspended from steel cables, connected on the Petržalka side to two pillars. The total length of the bridge is 430.8 m (1,413 ft), its width 21 m (69 ft), and it weighs 537 t (592 short tons). A special attraction is the flying saucer-shaped structure housing a restaurant, which since 2005 has been called UFO, on the bridge's 84.6 m (278 ft) pylon. The restaurant is reached using an elevator located in the east pillar, and offers a good view over Bratislava. The west pillar houses an emergency staircase with 430 stairs. Nový Most has four lanes for motor traffic on the upper level and lanes for bicycles and pedestrians on the lower level. One of our clients favorit trip: an AMAZING TRANSFER between Budapest and Vienna with a STOP IN BRATISLAVA, SLOVAKIA. Three Europen capital cities in one day, in 6 hours! Our special offer for travellers between Vienna and Budapest is an amazing transfer and scenic tour in Bratislava during the journey. Bratislava fascinates everyone. A direct car transfer from Budapest to Vienna (or vice versa) does take 2 -3 hours ... it's a very boring trip:) We have a bettert suggestion for you, if you want to see nice places during the journey: - it's BRATISLAVA! Traveling and staying there 2 - 3 hours makes the journey more interesting! Private car transfer between Vienna and Budapest with a side trip, scenic tour to Bratislava, Slovakia. Take a stroll through the traffic-free old town, and breathe in the atmosphere of its centuries-old streets, squares and buildings. Walk, or take a short minibus ride, up to the castle.